The inaugural Crosspointe road race will help new moms in need. It's a 5k run/walk event for the entire family. Proceeds go to Birth Right charity headquartered in Taunton (http://birthright.org/taunton). They help counsel moms before and after birth. They also supply formula, diapers, clothing, wipes, baby items (car seats, strollers) and furniture to financially challenged moms. Won't you help us make a difference in their lives this Mother's Day weekend? 5K Runners/Walkers start time 8 AM. Tee shirts given to the first 50 runners registering! For safety reasons, runners and walkers with strollers will line up at the back of the pack at the start line. NO DOGS, LEASHED OR UNLEASHED, ALLOWED ON THE RACE COURSE. Adults participating with their children do not need to pay or register. Start time 8:00 AM for runners aged 3 to 12. For safety reasons, all children up to age 12 must be accompanied by an adult. 8:00 AM Kid's (3 years to 12 years old) with their parents. 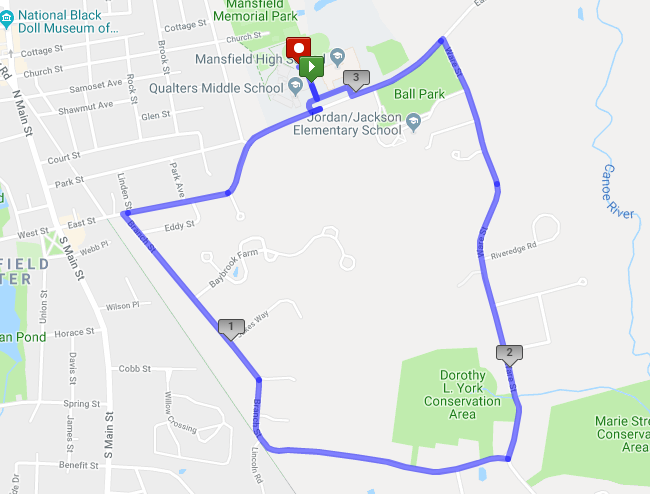 We will be following "Lenny's Loop" course starting and ending at the Mansfield High School. There are no course facilities or food on the course. Water will be supplied at the start and finish and 2 locations along the course. Please plan accordingly. There is bathroom accessibility at the High School at the beginning and end of the race. •	As a volunteer, you are an Ambassador for Birth Right International and Crosspointe Church and should treat runners, guests, participants, other volunteers with the utmost courtesy and respect. •	As a volunteer, take pride in your role! You are a part of one of Mansfield's greatest events! Attire should include clean jeans (no holes), and comfortable shoes. We are like the postal service — our event will take place regardless of the weather. Please check the weather and dress accordingly. We recommend dressing in layers as the weather can change quickly. •	Be prepared to answer many types of questions. Familiarize yourself with the course map and schedule of events. You can find this information on our website, mom.racewire.com or our Facebook page, facebook.com/Crosspointe to learn more about our event. •	You can sign up for as many shifts and roles as you like — but please make sure they don't overlap! Once you sign up, we depend on your commitment to being a part of our event. Your prompt arrival and completion of your shift are vital to the success. When you sign up, you commit to being present for that specific shift(s) during the entire length of that shift(s). •	Until 2 days prior to your scheduled shift, you are able to change/cancel your day/assignment by contacting the event coordinator listed on the recewire event page. •	Your assignment is complete when a staff member releases you. If you have not been released at the end of your shift, please contact a lead volunteer or staff member. If you are on the course, your assignment is complete when the balloon team passes and you have cleaned up your area. •	Children under the age of 7 may not be with you during your volunteer shift. Children between the ages of 7-12 must be accompanied by an adult. •	Depending on race needs, volunteer assignments may be reallocated — please be flexible. I know that running a road race is a potentially hazardous activity. I or my child (including a child I, as guardian, am registering) will not enter and participate unless medically able, properly supervised and properly trained. I assume all risks associated with participating, as well as the risks my minor child may incur, including but not limited to injury, falls, contact with other participants, the effects of the road and traffic, all being known by me. By entering the event premises, I consent to interview(s), photography, audio recording, video recording and its/their release, publication, exhibition, or reproduction to be used for news, web casts, promotional purposes, telecasts, advertising, inclusion on websites, social media, or any other purpose by Crosspointe Church (Crosspointe) and Birth Right of Taunton and Birth Right International (Birth Right) and its affiliates and representatives. Images, photos and/or videos may be used to promote similar Crosspointe and Birth Right events in the future, highlight the event and exhibit the capabilities of Crosspointe and Birth Right. I release Crosspointe and Birth Right, its officers and employees, and each and all persons involved from any liability connected with the taking, recording, digitizing, or publication and use of interviews, photographs, computer images, video and/or or sound recordings. By entering the event premises, I waive all rights me or my minor child may have to any claims for payment or royalties in connection with any use, exhibition, streaming, web casting, televising, or other publication of these materials, regardless of the purpose or sponsoring of such use, exhibiting, broadcasting, web casting, or other publication irrespective of whether a fee for admission or sponsorship is charged. I also waive any right to inspect or approve any photo, video, or audio recording taken by Crosspointe and Birth Right or the person or entity designated to do so by Crosspointe and Birth Right. Having read this waiver and knowing these facts, I for myself, and any minor for which I am acting as guardian and my heirs and assigns, and anyone entitled to act on my or my guardian’s behalf, do waive and release Crosspointe, the Crosspointe Road Race Committee, Birth Right of Taunton, Racewire, USATF, its employees, directors, assigns and certified officials, the Town of Mansfield and all sponsors, their directors, officers and volunteers from all claims of liabilities of any kind whatsoever arising from my/our voluntary participation in this race, even though that liability may arise from negligence or carelessness on the part of the persons named in the waiver. I attest that I am above the age of 18 years.